Manchester United have been linked with Atletico Madrid star Antoine Griezmann in the past and once again, the French international is in the lime light. According to Sport, the World Cup winning star is looking to leave the Rojiblancos, a year after signing a new contract with them. The Spanish source have mentioned that Manchester United are front-runners to sign the Les Bleus playmaker, who will turn 28 tomorrow. Another renowned source in the form of AS have also claimed that Man United could be a possible destination for Griezmann, who has a release clause of €200million (£171million) and on July 1st, the clause will be €120million. The Spanish outlet have further stated that the La Liga club could look to offload him before the clause is reduced. 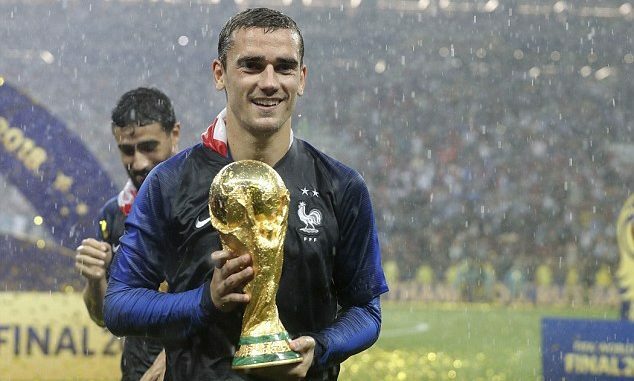 In my view, Griezmann is one of the top five playmakers in the world and his form has been consistently good for both the club and the country. He helped Atletico win the Europa League last season and at the World Cup, he directly contributed in 7 goals (4 goals and 3 assists) in as many games to lift the ultimate prize. In the current campaign, so far, in 38 appearances, he has netted 18 goals and provided 8 assists for Atletico under the management of Diego Simeone. Manchester United do need to improve the quality and depth of their attack and Griezmann, who can play in multiple attacking positions, would be a world class addition if the Old Trafford club can get his signing done. The presence of Pogba at United should attract his compatriot but as per Sport and AS, other top clubs in the form of PSG, Barca and Bayern are also linked with Griezmann. As per the player’s sister (Mirror Sport), he wanted to win the Champions League with Atletico and is disappointed after Juve ousted them. So, it will be fair to say that United must qualify for the next season’s CL or else, it will not come as any surprise to see Griezmann move elsewhere in the summer. By all cost, we need to break the bank to land him. He is a fantastic player who I have watched in many occasions. If I am the owner of man u, I will break the bank for him.